"It's like, total pick up a river rock and stuff it up your nose." We talk unique varietals as we taste through Waterfire Vineyards' 2012 Gruner Veltliner. (BTW: We updated the retail price on the video, but for some reason, YouTube didn't fix it ... grr. It's $22.) Are you a Waterfire Vineyards and/or Gruner Veltliner fan? Come talk about it. "When it comes to rosés, we're a house divided." Shannon practically salivates all over the camera as we taste through the 2012 Rosé of Cabernet Franc from Forty-Five North. Are you a Forty-Five North and/or dry rosé fan? Come talk about it. "The wine gods are angry because we haven't been doing podcasts." An angry thunderstorm guest stars as we taste through a Pinot Grigio from White Pine Winery in St. Joseph in our latest podcast. 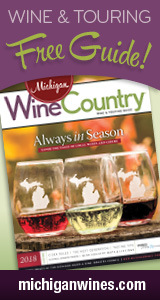 Are you a White Pine Winery and/or Pinot Grigio fan? Come talk about it. P.S. If you're curious about the "stuff" we mentioned occupying our brains for the last month, here's part of it. "Hey, it smells like Syrah and Pinot Noir!" Syrah meets Pinot Noir in this aptly named 2013 Syrah Pinot Noir from Mackinaw Trail Winery. We also dish on Mackinaw Trail's new(ish) facility in Petoskey and Shannon gets a pat on the head for being a Yooper. Are you a Mackinaw Trail and/or Syrah and/or Pinot Noir fan? (Or just a fan of dry red blends in general?) Come talk about it. "Not everybody wants to be punched in the face with tannin." We talk cold-hardy hybrids (and is there any year that this is a more appropriate topic?) as we taste through Flying Otter's 2011 Marquette, a smooth easy drinker. Are you a Flying Otter and/or Marquette fan? Come talk about it. "Papaya, damnit, papaya!" We promote confidence in identifying wine descriptors as we taste through Cody Kresta's 2012 Pinot Gris. Are you a Cody Kresta and/or Pinot Gris fan? Come talk about it. "I would not be surprised if sometime in the next year, Larry Mawby takes a restraining order out on you." We get back in the post-Michigan Wine Month video podcast groove with a tasting of Leland, a rosé sparkler produced under L. Mawby's Domaine Leelanau line. (This one's a longer podcast, but if you love sparkling wine, you might appreciate some of the geeking out over sparkling wine production.) Are you an L. Mawby and/or sparkling wine fan? Come tell us about it! *This video has a slight sound distortion, so you might want to turn down your volume a bit. We're working to fix the issue! "We're fired. I fire us both." We bumble our way through tasting the 2011 Dry Riesling from Boathouse Vineyards, a bright, tasty Riesling that would be perfect for sipping in the great outdoors (if it weren't 0 degrees out). Are you a Boathouse fan? Come tell us about it! "You're not going to get pinched today." We get in our quota of green on St. Patrick's Day by drinking white wine in a green bottle: 2 Lads Sparkling Riesling. (That counts, right?) Are you a 2 Lads fan? Come tell us about it!